The goal of the Circle of Care group is to support members of the Victoria Shambhala Centre who are in life transitions and would benefit from some community support (for example, after a hospital stay, post-birth, or in relation to end-of-life and palliative situation). We take a collaborative approach by encouraging our members to reach out for this community support, and address issues of isolation and lack of social support and health care. Please join our monthly meetings every last Friday of each month from 5-6pm at the community room at Shambhala Centre. 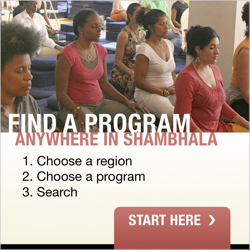 We will discuss the implantation of our Circle of Care within Victoria Shambhala.